South of England foraging friends - it's that time of year again! The Wild Garlic is in leaf this week (mid March 2015), making our whole neighbourhood smell like a hot dog van replete with fried onions. We've been out picking just a few leaves - it's easy to get carried away and think you have to bring home a bag full, but unless you plan on freezing as a herb butter it's really only a few fresh leaves that you need. One of the most special aspects of foraging is it's seasonal nature, and this couple of weeks where we can wander to the strip of woodland near our house to harvest a couple of leaves each is made more sweet by it's brevity. Pick clean, healthy looking leaves that you are 100% sure you have correctly identified, away from roads and sources of contamination (I'm not counting the vacuum cleaner or supermarket trolleys in the local 'stream' as contamination). I don't pick more than one leaf from each plant and only where it is growing really abundantly. 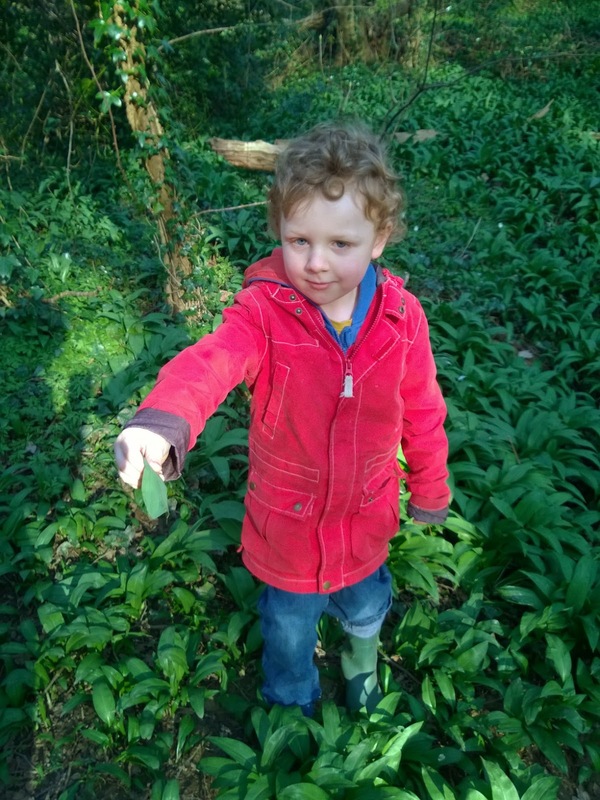 Watch out for kids picking poisonous leaves poking through at this time of year, including lords and ladies. I have a policy that the kids show me what they want to pick and get my Ok for each time we move to a new patch. They also are taught from very early on to never ever put anything in their mouths without showing me first - including things like blackberries as there are often very poisonous berries such as bittersweet growing amongst them. Wild garlic, or ramsons as it is sometimes known, is good in stir fries, with scrambled eggs and omelettes, in noodle soup and a whole host of other delicious places you would normally use spring onions.